As Bee Gees fans around the world count down these final few days until the release of Barry Gibb’s new album In The Now on Friday, here’s part 2 of my interview series with him. As mentioned in part 1, this collection of transcribed articles for the Roxborogh Report is a little bit different than the clips that will play on my radio shows and the newspaper and magazine articles I’ve written based on the interview. These blog transcriptions are reprinted purely with the diehard fans in mind. 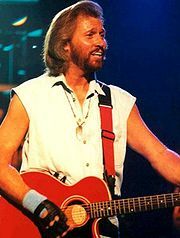 For Barry Gibb In The Now With Tim Roxborogh Part 2 I’ve chosen a section of the interview (Barry and I spoke on the phone at the start of September) where he talked about how Robin tended to want Bee Gees albums to have more songs on them whereas Barry would lean towards wanting fewer. Barry mentioned a couple of songs that he felt would’ve been hits if they’d been singles, though concedes that one of those – High Civilization – may’ve have been a little too “abstract” to have worked on the radio. As far as my own opinion on what songs should’ve been singles, it’s a bit of pastime! Where do you start? Unlike a lot of fans, I love the High Civilization (1991) album. While it may suffer from protracted intros on some of the songs, the songwriting, the rhythms and the melodies weren’t just strong, they were really very interesting. With the famous stomps from You Win Again (1987) having been such a success just four years earlier, perhaps Barry thought the heavy, electronic percussive sound of High Civilization could’ve had similar cut through. The off-beat chorus is unique and it’s a song I find myself liking more and more as an adult than I did as a kid for whatever reason. Personally, I think Robin was right that the Chain Reaction-recalling Secret Love was the best choice as single given it hit the UK top 5 and went all the way to number 2 in Germany. But it didn’t have to be one or the other. Probably the main issue as far as Stateside success went was that When He’s Gone was promoted instead of Secret Love. This was perhaps due to the fact the similar-sounding Chain Reaction (Diana Ross, 1985 – written by the Bee Gees) failed in the States despite being a UK #1. Speculation from me of course, but if you haven’t listened to High Civilization in a while, go back to it. When He’s Gone, Happy Ever After and The Only Love are all beautiful, big-hooked, harmony-filled Gibb songs. Ghost Train and Party With No Name are also dark horse Bee Gees R&B tracks that seldom get mentioned but are filled with ideas (the drum loop at the end of Ghost Train followed by the lighting of a match, for example) and modern – for the times – production. Fast-forwarding a decade, my position has always been that Deja Vu from This Is Where I Came In (2001) should’ve been re-recorded by all three brothers and then put out as a single. It had the hooky hallmarks of a potential smash, but maybe wasn’t considered due to it being one of the solo tracks Robin did for the album. For fans unfamiliar with that project, it was a almost like a collection of three solo EPs plus a handful of group songs to create a full Bee Gees album. Deja Vu sounds good, but imagine how good it could’ve been with the presence of Barry and Maurice too. Then there are the songs left off those 90s albums Size Isn’t Everything (1993) and Still Waters (1997) that rank as some of the finest late-period Gibb songs: tracks like My Destiny (1993) and Rings Around The Moon (1997), though there are many more. But as Barry said with a laugh during this interview, “You can’t change a thing now!” He’s right, but it’s often fun to speculate about some of the what ifs. TR: All killer no filler, that’s great! Well I don’t think there’s filler on any of your albums but it must be very liberating. BG: …but there are songs that we… Robin was always looking to put more and more on an album rather than less is more, so you know, that was Rob. TR: Is that something from back at the start or are you even thinking of late period Bee Gees albums that there were kind of extra songs there that maybe you wouldn’t have had? BG: Yeah. I would say there are extra songs on a couple of those later albums that I personally wouldn’t have put on the albums, but we all have to agree on something or we didn’t do it. Robin wanted those extra songs, like for instance, Robin wanted to record Heartbreaker as us and I never really saw a cause to do that. He wanted to do Islands In The Stream which he eventually did, but I never saw a real reason to do that, but that was up to Rob. Thanks for giving some more lights to the Bee Gees' albums and songs from 1993-2001. I consider DEJA VU as the best song on TIWICI (along with the title track), both the unusual melody, production and arrangement are very strong. MY DESTINY alone would have lifted SIZE…to a much more balanced and powerful album. Besides BLUE ISLAND, FOR WHOM THE BELL TOLLS, KISS OF LIFE and HAUNTED HOUSE this is the best track. I don't like ANYTHING FOR YOU. HIGH CIVILIZATION is difficult to many fans, because of the less organic sound. Especially the cold and hard rhythm track on GHOST TRAIN I can't get used to. A few songs turns out the right way, since DIMENSIONS and THE ONLY LOVE have real superb productions and song structure. Actually, most of the songs are much better showcased in the live-versions from HC-tour, with a energic and organic sound. The arrangement for the title song was also much better live, since the album version was repeatedly at the end of the song, strangely enough. In an interview in 1991, Barry actually told the reporter that Robin and Maurice this time around wanted a more electronic sound, unlike himself that had wanted the new album to be more acoustic!!! "All killer no filler, that’s great! Well I don’t think there’s a filler on any of your albums" That's the most amazing gift the Bee Gees gave their fans. How many other artists can claim this? Fascinating to read about late-period Bee Gees album tracks, as there is so little written about it. Especially HC, which was such a change in direction. The group was working as it should with different members pushing in different directions resulting in really creative output. And I'm very happy to read about "855-7019"…as much as I consider Size Isn't Everything perhaps their best album, for the life of me I can't understand why that song didn't make it to it (even though I sure can imagine…) I think it has, on the verse, one of the best vocals from Barry ever! I'm loving these reports Tim! I have to agree with you, since I heard 855-7019 about 3 years ago (I'm 19 atm), I always thought that could've been a HUGE hit. Same goes to Haunted House and Kiss of Life. I hope that Grand Illusion or SC Lovers get to at least Top 10.